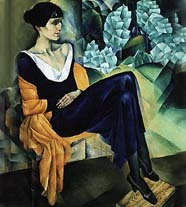 As part of ARTSFEST2004, Art is Permitted Everywhere is hosting an open air birthday tribute poetry reading for the great Russian poet, Anna Akhmatova, celebrating her life and that of other “exiles” through readings of her and others’ works. The Translation Project will do a reading of the poems created in diaspora by Iranian poets which do, in fact, concentrate on the theme of exile, even if it does not solely gather poems about exile, or poems of exile. Washington Square Park, San Francisco, Saturday May 29th 2-5pm.